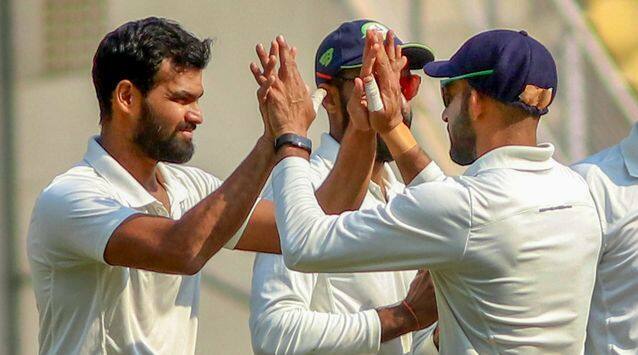 Defending a total of 206, Vidarbha were led by left-arm spinner Aditya Sarwate who claimed 11 wickets in the match, including 6/59 in the second innings as Saurashtra were bundled out for 127. 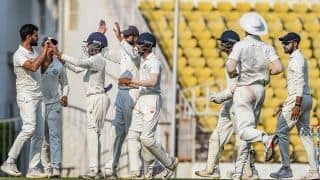 Vidarbha, who had claimed their first Ranji title last year – the first in over 60 years – were buoyed by lower-order batsman Akshay Karnewar‘s unbeaten 73 in the first innings, helping his side to 312. At one stage, Vidarbha, after electing to bat were tottering at 139/6. In reply, Saurashtra fell short of Vidarbha’s first innings total by five runs with opener Snell Patel scoring 102, even as Sarwate claimed 5/98. Fellow spinner Akshay Wakhare scalped 4/80. 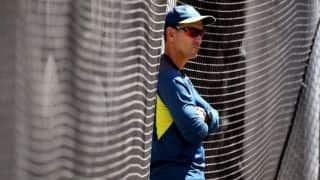 For Saurashta, skipper Jaydev Unadkat made 46, batting at No.10. In the second dig, Vidarbha’s big guns failed once again as as they were shot down for 200. 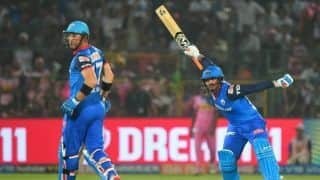 Sarwate played a key role with the bat, top-scoring with 49 while for Saurashtra left-arm spinner Dharmendrasinh Jadeja took 6/96. However, defending total, Sarwate came to fore claiming 6/59 and fittingly took the winning catch , that off Unadakat off Wakhare.